PUSH METHOD AND LOOP RELEASING-THE FULL INTUBATION IS MADE POSSIBLE ONLY WITH THESE TECHNIQUES. The colon inherently does not have many acute bends, which allows stool to pass through, and there is no distinctive top of the sigmoid colon. Pushing the scope would make an isosceles triangle with the center of the free segment as the top since the two base angles are fixed. Pushing the scope even further is the push method. The apex angle would become obtuse because of the scope's elasticity, and the scope would make a circle, forming a loop when the scope reaches the end of the free segment (Chart 13-1). Pushing the scope would make an isosceles triangle and eventually form a circular loop. There are only two kinds of loops; one released clockwise and one released counterclockwise (refer to page 60 regarding the loop judgment). Two loops are mirror symmetry and the former is called "alpha loop" and the latter "reversed-alpha loop" (Chart 13-2). 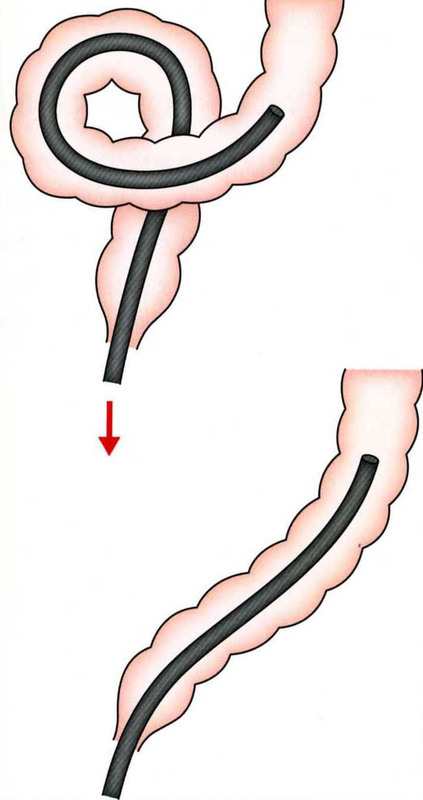 Regarding the sigmoid colon, 80% would form the alpha loop and 20% would form the reversed-alpha loop, while the transverse colon would form the reversed-alpha loop 100%. Essentially, not to form a loop is ideal, however, it is too much to ask for beginners. Even so, if the loop is released, the full intubation can be achieved (Chart 13-3). After all it is beginners' inability to release the loop which explains why they cannot carry out the total intubation. When a beginner asks for help and I take over, without exception the scope feels heavy and has an obvious loop. What I will do is always the same, releasing the loop in an orderly manner. After I turn back the scope, the rest of the intubation can easily be done. That means that only if you can release a loop, the full intubation is possible. Therefore, it is strongly recommended for beginners to master the technique to release a loop completely first and foremost. The transverse colon procedure is the same as the sigmoid colon procedure. Pushing the scope from the splenic flexure would stretch the transverse colon, which was not bowing in the first place, and the mid-transverse colon would make an acute angle. Further pushing would twist the intestine and end up forming a reverse-alpha loop (Chart 13-4). When the tip traverse the hepatic flexure, hook the scope and make a counterclockwise rotation to release the loop while withdrawing and straighten the transverse colon. Even beginners can intubate the scope only if he can release the loop. After being stretched, the transverse colon would form an isosceles triangle and change into the reversed-alpha loop. The Singular Method is better suited for the pull method and its success rate is high, however it is not 100 %. When conditions are poor, it tends to end up with the push method. For example, with the Singular Method, I apply the push method in 20% cases of the sigmoid colon, and in approximately 10% cases of the transverse colon. Even when the push method is chosen, it should be done only after the pull method was tried first and failed. It is very important to try to pull before changing to pushing. If the scope is pushed without pulling beforehand, it would form a non-releasable, complicated loop while once it is pulled, the scope would form a simple loop like on the colon model even with pushing and it is easy to release the loop. Why is that? When keeping pushing the scope, you see the view on the monitor turn around, that means that the scope is forming a complicated twist. Pull the scope before pushing it and keep the entire scope on one plane, then, push the scope straight, trying not to turn the vision around. In that, the complicated twist will not be made. If the view turns around, stop pushing and pull the scope until it is put on one plane and then push the scope again. Do not rotate the scope and push it straightforwardly. Try not to turn around the vision, and once it starts twisting, stop pushing and pull the scope.